Looking for a stylish lightweight wrap? 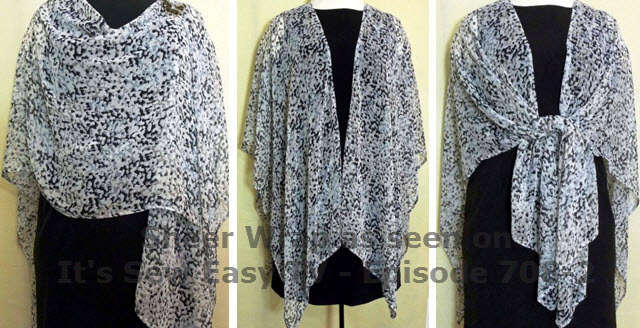 The sheer chiffon wrap in the photo was featured on the popular PBS It's Sew Easy TV show, episode 708. It's based on a similar style from my book titled Wrapped in Embroidery only this one is made from a single layer of fabric using just a straight stitch! This wrap is beautiful and it can be styled a variety of different ways. Dressed up or dressed down, this wrap feels wonderful to wear!!! Here you will find a Free tip sheet with instructions for the original Sheer Chiffon Wrap pattern. Learn how to hem slippery chiffon and create a french seam for the shoulders. Be sure to visit ﻿﻿itsseweasytv.com﻿, and login ﻿for additional project information for show 708-2. Simply click on the pdf icon below to download. Enjoy!